Create a name, logo and visual identity package for a sound art festival, which celebrates the diverse methods of sound art and sound theory. I wanted to show the relationship between sound and movement. Conventionally, we often times think that sound creates movement (bobbing your head to a good beat, dancing to your favourite track, etc.). But what if it was the other way around? What if the movement was what created sound? The identity created for the Beat Sound Art Festival came from the idea that beats can in fact be made from movement. The inspiration came from Mikhail Baryshnikov's Human Beat Box dance performance, where he was linked to a contraption that amplified his cardiac activity. The only "music" that the audience heard was Mikhail's heartbeat. As he danced, his heartbeat fluctuated depending on the speed of his movement, which in turn influenced his improvised dance. And there you have it. Movement in fact can create a beat. I created posters, banners, event tickets and website for event participants. Create a new corporate identity for Bristol City Council to be rolled out to the city’s mobile and desk site. When designing the new identity for Bristol, I wanted to reflect the city’s vibrant, independent and community feel. I wanted to show Bristol's recent economic growth, diverse population, abundant street art and cosy cafes and restaurants, through vibrant colours and tailor my design to a more young and energetic community. Create an identity and a package for any boutique product. 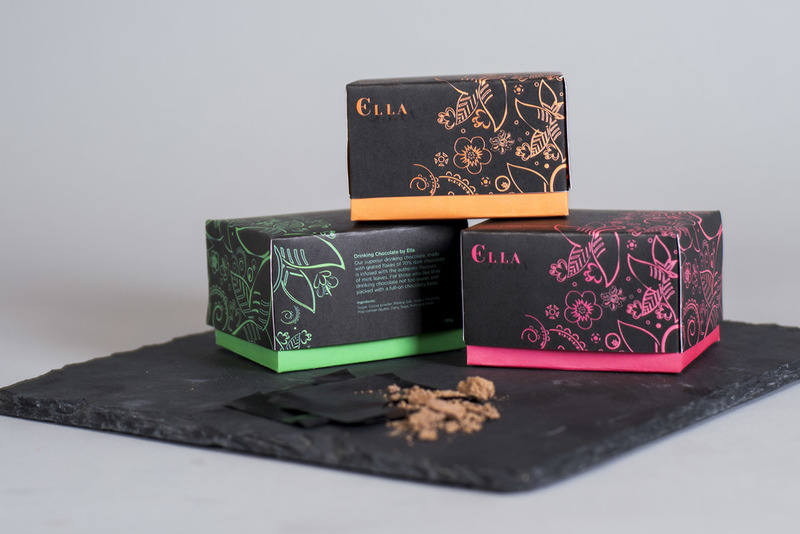 Ella's luxury hot chocolate comes in a variety of three flavours: raspberry, mint and amaretto/vodka–infused. Each box contains 10 packets of rich shaved cocoa – the perfect gift for that special someone. Inspired by my Russian roots, the pattern was created to reflect "babushka" scarves and floral rugs. The logo is comprised of both the English and Cyrillic spellings of the name Ella (which also happens to be my mom's name). Design a finished size brochure for the BFI advertising the Golden Years of Hollywood. The BFI is celebrating the Golden Years of Hollywood genre in a dedicated set of film screenings. I wanted the brochure to have the look and feel of the 1930’s era and for viewers to immediately recognise the genre. I created a concertina folded brochure, where one side could be used as a poster. Create the "look and feel" for Herman Miller's annual report. Herman Miller is a recognised innovator in contemporary high–end furniture designs. I wanted to show its innovative and forward–thinking approach, love for shapes and colour through my design. I created a few spreads (cover, company overview, milestones, financials, 5–year summary) to show the "look and feel" of the annual report. 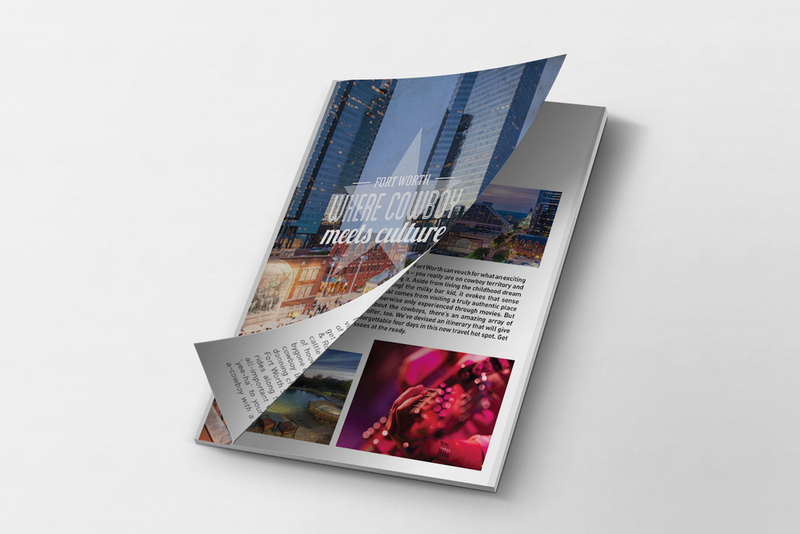 Design a flip mag for Black Tomato, a luxury travel company, and Fort Worth tourism board to highlight particular activities/points of interest for clients traveling to Texas.